Delorean's newest, Subiza, is an alt-dance gem loaded with bass backbeat, claps and building techno-influenced looping tracks. It also has a distinctly European feel (partially because the band is from Spain's Basque country), melding the rock/alt vibes of Phoenix, the vocal/lyrical tendencies of Peter, Bjorn & John and the club beats known to listeners of Erasure, Fever Ray, and Hot Chip. This is ostensibly electro-pop with layers of natural sound thrown in to create welcoming feel. For me, it's the idea of removing the individual layers to hear what's happening that makes the album so wonderful. Underneath, these are guitar and piano tracks, sweet and poppy, but also opening aware and sad. Minor chords and somber bass lines covered in loops and (at times Genesis sounding) drums fill the nooks and crannies of Subiza, giving it soul and a unique relistenability (I'm sure Urban Dictionary is all over this "word" already). As with many dance albums, the mix and the beat take the forefront, and it's easy to forget how much is underneath. Ultimately, if we've learned anything from Pygmalion, you can dress Eliza Doolittle as a duchess, but you'll never completely take the Cockney out of her, as well you shouldn't. No matter how flush with sound Delorean becomes, there is still a sense that the reason why their dancing (and compelling us to join) is because misery, or at least self-awareness, loves company. "Endless Sunset" and the track preceding it "Real Love" both have a distinct attachment to minor chords, dour piano/synth, and a driving, splashing, heart-quickening drum beat. Neither song is about wanton acts of carnality, or youthful exuberance, but they pretend that they are in the way the make you move your feet. (As a brief digression: this is exactly what MGMT's beloved Oracular Spectacular did just as well. Creating music so fun to hear that we forget to listen to it, leading many listeners to consider MGMT's newest to be some sort of downer, when really, Oracular Spectacular, excepting perhaps "Electric Feel" is a sad album about the delusions of happiness we are taught to create regarding our youth, our future and our careers.) Dance music is difficult to fully appreciate aesthetically because it melds the sadness and disillusion of life with sounds of celebration, but really, to grab a hold of any genuinely happy, eternally positive music, we're best to look at marching band tunes. Anyway, Subiza maintains an exceptional balance throughout by touching on the sad stuff ("Grow") and throwing out dense, transcendent excellence with a catchy, poppy choruses ("Simple Graces" and "Infinite Desert," among others). 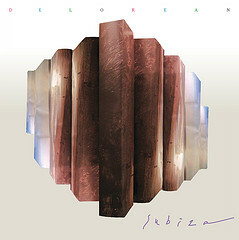 Delorean succeeds with Subiza by pushing the limits of the dance music to its dark and light boundaries. This album will electrify you, and ask you to question your perceptions. What else could be required of a fun, upbeat slice of excellence. Listen to it now, via interweb here.